January 21, 2013 by Alphageek in "Midnight Moon", "alphageek", "apple pie", "moonshine", "review"
I have to admit it. I have been watching the television show Moonshiners, since it started. I don't know if it is "real" or not. At this point, since some of the folks on it make me laugh, I decided that I don't need to know how real, or scripted, the show is. I have already been to the location that distills Virginia Lightning, and I enjoyed their product. I have to admit that they did not think this web site worth their time to post on their web site, but neglect sometimes hits the alphageek. Do you suppose the good folks at Virginia Lightning mentioned me when they were on Moonshiners ? I suppose that part got edited out. Sometimes Moonshiners shows the distribution end of the business. While I cannot believe a guy would let himself be filmed while running moonshine, I guess I cannot be certain. As a part of the running the hooch, the guy takes the moonshine and mixes up a drink called Apple Pie. Basically, he takes some moonshine, adds some apple juice and some cinnamon sticks. He passed it around for people to sample before making a purchase. This business model appeals to the alphageek, enough to perhaps give this unusual combination a try. I have to admit, even though I am a bourbon guy, that drink looks pretty good. Besides, living in Virginia almost my entire life means I need to try some moonshine. So, I take a look at my purchase after I get home. The drink is attractively packaged in a jar shaped like a mason jar, complete with a lid. Think old school mayonnaise jar. 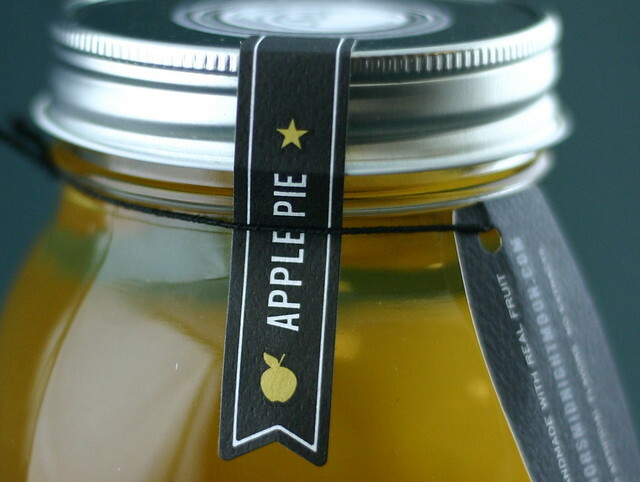 The jar and labels are actually attractive in a simple sort of way. There is another picture at the end of the article, but I liked the jar so much, I took a series of about ten picture that you can see at this link . I will say I did not research this product before buying. Edit:Piedmont Distillers makes this fine product. (Since they actually contacted me via Facebook, I thought I could at least let you know.) 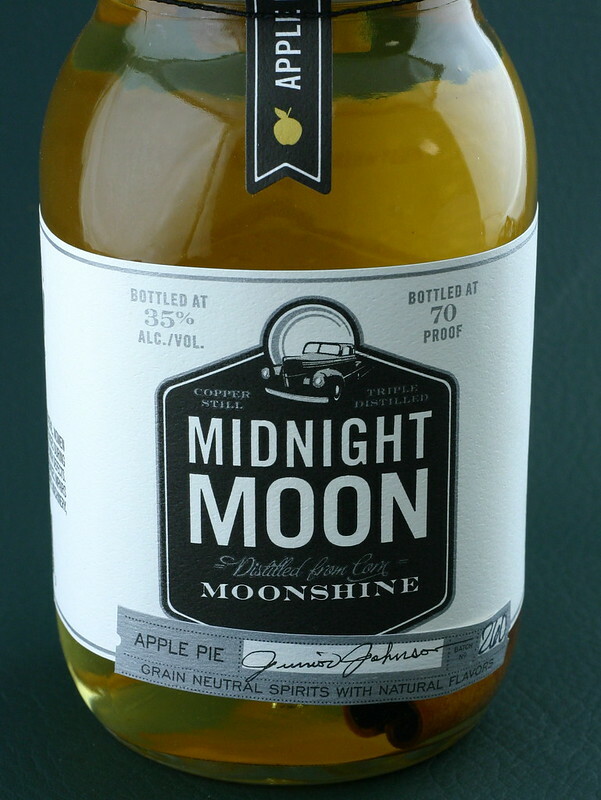 If you want to know about the background, I suggest you go to google and type moonshine Junior johnson apple pie, or some other such attempt. I do not just take other posts from other sites, and put them on here. I promise all original content and nothing more. If you want a site that recycles other people's work, they are out there. After all some really big bourbon sites have stolen my pictures. You know who you are! Buy a camera! I sat down to take a sample. When I opened the bottle, I decided to sample the aroma. While the moonshine did not smell bad, it smelled sort of medicinal and made me a little hesitant to sip a little. After a minute or so, I gave in and tried it. I could not have been more wrong, this is a great flavor! No wonder the runner was giving a sample away, the stuff sells itself. The apple juice and cinnamon work together, giving a taste somewhat like apple pie with a kick. I tried a little more, and decided that this drink was going to get a place on the shelf, along with my bourbon. The flavors taste anything but medicinal. I had a flashback to some "grain punch" I sampled once or twice. In both cases, the flavors cover up the bite of the alcohol and allow for a smooth and pleasant drinking experience. Just be careful not to over enjoy because I suspect these flavors could sneak up on you. Now that I am enlightened I am tempted to try to make my own apple pie. Of course, I will have to use the legal moonshine, and leave the running to someone else. Don't ask me how to make apple pie. Try that new thing on the internet, google, and see if you can find a recipe. "Midnight Moon", "alphageek", "apple pie", "moonshine", "review"